My solution is to freeze those berries (or peaches or whatever it happens to be) to be used in a different way in the future. I did just that with some bland strawberries a few years ago: I froze them until peaches were in season and made a batch of delicious strawberry-peach jam. Yum! 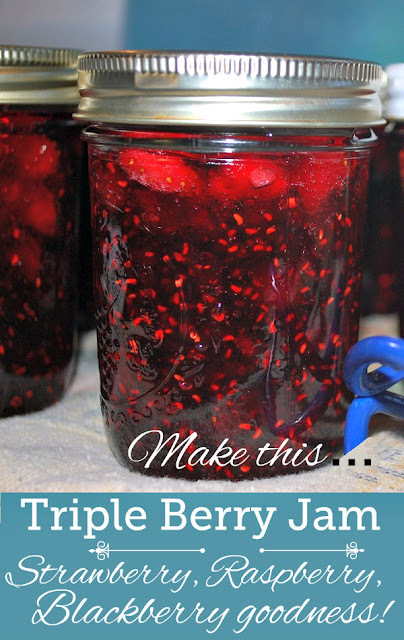 Now that we live where wild blackberry thickets threaten to swallow fields whole - I'm not kidding, some of them cover more ground than a house - I always save enough strawberries to make a couple of batches of this triple berry jam. Even if the strawberries are flavorful and juicy enough to eat whole. Berries are easy to flash freeze by spreading in a single layer on a metal baking sheet in the freezer for a few hours. When frozen, they go in a zipper bag and back into the freezer. You can flash freeze them whole, or slice them up before spreading them on the cookie sheet. Raspberry season is hot on the heels of strawberry season and then, finally, wild blackberry season arrives in mid-July. It's triple berry jam time. You'll find the directions inside boxes of pectin and at the Sure Jell website. When I make my harvest apple jelly I don't use any added pectin. Strawberries, raspberries and blackberries contain low amounts of natural pectin, so I use commercial pectin. We don't consume a lot of jam so I only make a batch or two, and the cost of the pectin isn't a burden. *The directions define "prepared" as stemmed and thoroughly crushed berries. Did you notice how many times it specifies "exactly"? Since my husband doesn't care for blackberry seeds, I added filtered water to the fresh blackberries, mashed them up and simmered for an hour or two, then strained out all the fruit pulp and seeds and used juice instead of berries in this jam. The first step to canning anything including jam is to sterilize the jars. I run mine through the dishwasher. I use half-pints for jam and jelly. Keep your sterilized jars in a sink of hot water until the jam is ready to add to the jars. Hot jars + hot food = less chance of cracked jars. Gather all the items you'll need - jar lifter, rings and lids that fit your jars, canning funnel, lid magnet-thingy (all of those are affiliate links). Put the canning lids ("flats") in a pan of hot water to soften the rubber seals. Wash and dry the rings. Add water to your water bath canner (I use a deep stockpot with a cake rack in the bottom) and bring it to a simmer so the water will be warm-to-hot when you're ready to add the jars. Once again: hot jars + hot food + hot water in the canner = less chance of jar breakage. With all the preparation finished, it's finally time to actually make the jam. Sometimes it seems like the preparation takes longer than the actual making, doesn't it? Mash the thawed strawberries with a potato masher. I use my mom's; I love using the kitchen utensils that were hers, and having that connection with her even though she passed away many years ago. Measure the mashed strawberries and add to a large heavy pot. Then mash, measure and add the raspberries. Thawed berries are happy to release their juice faster and easier than fresh berries, a side benefit of freezing them instead of using them fresh. Then mash and measure the blackberries. I used a full cup of the blackberry juice I made instead of using mashed berries. Mix the pectin into the fruit. Measure the sugar into a bowl. Personally I don't use as much sugar as the directions call for; I know the pectin directions say that you must use that much so it will gel correctly, but I like my jam soft-set anyway. And I just can't make myself use more sugar than fruit in jelly or jam. Sure Jell also sells no-sugar pectin (affiliate link) for use in low-sugar and no-sugar recipes. Heat up the fruit and pectin mixture to a rolling boil, then add the sugar and stir it all together. When it all comes to a rolling boil, stir the mixture constantly while it boils for one minute, then take the pot off the heat and ladle the hot jam into the still-warm jars using your canning funnel, leaving 1/2" headspace. Wipe the jar tops with a clean damp cloth, add lids and rings, and put each jar in the canning pot. Add water to the canning pot so there's at least an inch of water above the tops of the jars. It's easy to tell how deep the water is: stick the handle of a wooden spoon (I used a black plastic one) in the water to the top of a jar. When you pull it out, the wet part shows you how deep the water is. That's one of those "smack your head" moments, isn't it? That's how I felt when someone told me that trick! Genius! Put the lid on your canning pot and bring the water to a boil. Begin timing when the water comes to a full rolling boil and set your kitchen timer for ten minutes. If you live more than 1,000 feet above sea level you'll need to add one minute, so set your timer for 11 minutes. Add another minute for every additional 1,000 feet in altitude. Recipe Tips has a very comprehensive resource on processing times. When the timer dings pull out the jars with a canning jar lifter and set them on a folded towel to cool. Oh, that pinging sound the lids make when the lids seal is like music to a canner's ears, isn't it? Leave the jars undisturbed for 24 hours. Then wipe them with a damp cloth and remove the rings, label the jars and put them away in the pantry. Label your jars! It only takes a few minutes and you'll be glad you did later - or sorry that you didn't. If nothing else, use a Sharpie to write the year and contents on the lid. The flavor is complex; I can taste the strawberries but not quite... the raspberries are there... the blackberries aren't overpowering. It's .... perfect. I think their exact proportions are exactly right - except that they recommend too much sugar, that is. If you planned ahead, you also made a loaf of bread that morning. Maybe I should add "make a loaf of homemade bread" at the beginning of the jam-making directions? Even if you "picked" your berries at the grocery store, this jam will be delicious! Yum! I don't have a strawberry patch anymore, but I hope to plant one this fall or next spring. I'm hoping to put strawberries in this fall too, Lisa! It's still a little early here too; I'm waiting impatiently, Michelle. Freezing produce until some more come into season always works well. Love your combination of berries. Found you on Simple Homestead Hop. Triple Berry is one of my favorites! My children are jelly/jam snobs - they refuse to eat store-bought. Margy, we have wild blackberries too, though they're usually ripe around the Fourth of July. I like that we don't have to put any work into them, too - but on the other hand they're threatening to take over the pasture! Your jam looks delicious, Kathi! I didn't realise that you could use frozen berries to make jam, I'm so pleased to discover this! Thank you so much for sharing, and for being a part of the Hearth and Soul Link Party. Sharing on the H&S Facebook page and scheduled to pin. Hope you are having a lovely weekend!